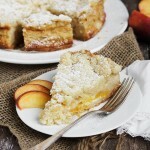 A delicious peach cake, with a shortbread-like crust, a creamy peach filling and a crunchy crumble topping. Sprinkle about 3/4 of this mixture over the bottom of the prepared springform pan. Don't press it down at all, but move it around a bit so it goes up the sides just a bit. Scatter the prepared peach slices over the crumbs (avoiding the sides), then sprinkle the remaining crumb mixture evenly over the top. Again, do not press down. Leave it as is. Bake in the preheated oven for 20 minutes. When the cake has baked for a further 25 minutes, remove from oven. (The egg mixture should have set somewhat so that the crumbs won't sink into the cake. If it is too liquidy still, return to the oven for a few more minutes.) Evenly sprinkle the crumb mixture over the top. Return to the oven and bake a further 25-30 minutes. Note that the cake will be sunken in the middle, even when it's "done". As long as it's not jiggly and a tester inserted in the centre comes out with just crumbs (not liquid), it's ready to take out of the oven. It should have bake about 70-75 total, including all 3 steps.